Porto is not the most famous place in Portugal, unless you have a particular affinity for a particular form of liquefied grape. 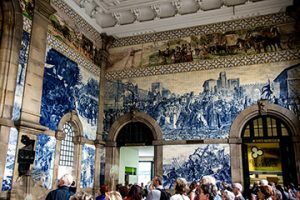 Porto is, literally, the Second City of Portugal, its second-most-populous place with 1.8 million people in the metropolitan area. 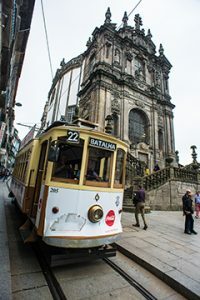 Porto (also known as Oporto) has always been a mercantile city, and this is evident in the style of the buildings lining the Avenida dos Aliados, the core of the downtown area. 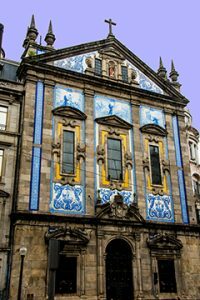 The center of town, unlike other major Portuguese cities, which tend towards the baroque, is granite and monumental. Lisbon is the grand city of palaces and monasteries and monuments and a metropolitan population of about 2.8 million. All photos by Corey Sandler, all rights reserved. Porto is instead a place of broad shoulders and hard work, in some ways the economic heart of the country. But it is the home of a form of liquid gold. The reaches of the valley of the Douro River have a microclimate that is optimal for cultivation of olives, almonds, and especially grapes. Douro may come from ancient Celtic tribes, for whom the word meant water. In Roman times, the river was personified as the god Durius. Or, and this definition is much preferred by modern Portuguese (especially in the tourist bureau), the name may mean “River of Gold”, as in Rio do ouro. The most famous of the wines is Vinho do Porto, a fortified wine, typically a sweet red wine although there are also dry, semi-dry, and white varieties. Port wine is fortified by the addition of a neutral grape spirit known as aguardente in order to stop the fermentation, leaving residual sugar in the wine, and to boost the alcohol content, usually to about 19 to 23 percent. The wine is then stored and aged, often in barrels stored in a cave (pronounced “cahv”) before being taken from that storage cellar to be bottled. The Douro valley was defined as a protected region for winemaking, an appellation, in 1756, making it by some measures the oldest defined and protected wine region in the world. Over a hundred varieties of grapes are sanctioned for port production, although only five are widely cultivated and used. We’ll raise a toast with a few after dinner tonight.